Admittedly, my expectations were quite low when I ordered the re-engineered Kchibo KK-9803 for a mere $14.90 from a seller on eBay. It is, without a doubt, the least expensive portable shortwave receiver I’ve ever purchased new. Now I know why. Indeed, I found it hard to believe that this was actually a DSP radio, and even asked the seller to confirm this in advance of purchase. 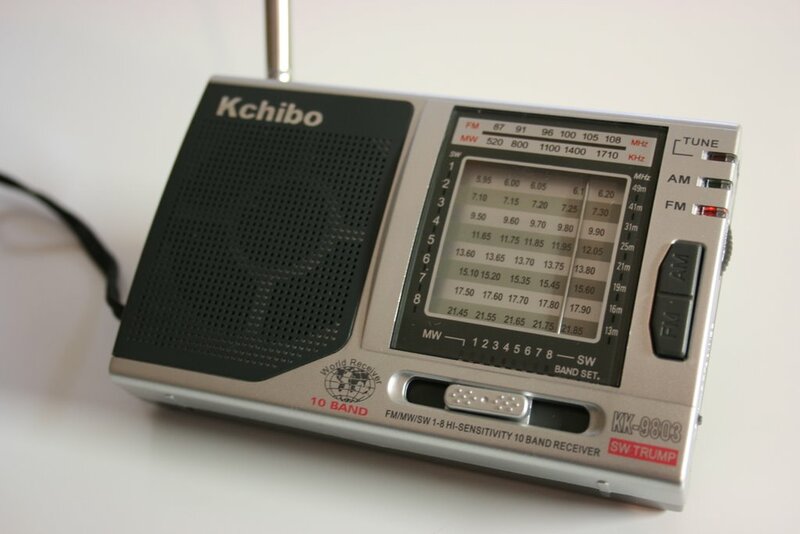 Part of my doubt arose from the fact that the Kchibo KK-9803 has been on the market for a few years as a no-frills analog radio. At some point this year, Kchibo “enhanced” this model with a DSP chip, to be much like the recently reviewed Degen DE321. I purchased the Kchibo KK-9803 on a whim. Could this cheap radio offer enhanced performance with its new DSP-enhanced engineering? The short answer: No. I was completely underwhelmed by the Kchibo KK9803. While the idea of affordable DSP performance is a good one, the implementation of the DSP chip in this unit is, unfortunately, poor. My primary criticism is that the shortwave band segments are much too close to one another on the dial–hence, when tuning, the digital tuning steps (perhaps 5 kHz?) are too narrowly-spaced to offer any sort of tuning accuracy. Barely moving the tuning wheel, one may pass over even a strong station undetectably. The only hint of the station’s existence may be a quick blip or audio buzz. I must confess that the experience of band-scanning (tuning) this radio offers is the worst I’ve ever known. One basically cannot tune and “hear” station presence like one would on practically any other radio product. While comparing this radio to the Degen DE321 and Tecsun PL-380 (two other DSP portables I had on hand), I had difficulty locating even benchmark stations like China Radio International, Voice of Greece, RCI, and others; in fact, I couldn’t even tune in Voice of Greece on 9420 kHz because that part of the 31M band is chopped off of the KK-9803’s dial. Tuning across the band produces a very strange choppy sound, mostly void of the typical sounds you hear as you tune past stations while band-scanning on most other radios. I did manage to tune in a few stations with considerable effort. How one finds a strong station at all is by locating the spots on the band where sound is dead, and then meticulously fine-tuning around these areas. I use the phrase “fine-tuning” quite loosely, as there is no actual fine-tuning wheel–by this, I mean making the slightest possible movements of the tuning wheel and just hoping for the best. This demands great fine-motor skills–but even greater patience. Perhaps more annoying, once you actually manage to lock in a station, within the next five seconds the DSP chipset increases the volume in three overly-dramatic steps–from soft, to medium, to OUCH. Tuning this radio requires not only patience, but if using good earphones, instant readiness to adjust the volume for fear of its increasing to the point of discomfort. 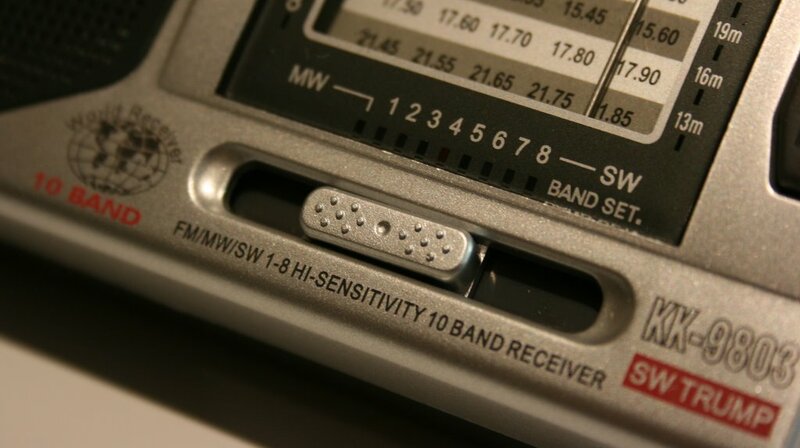 The KK-9803's band selection slider switch is loose and sloppy. One more positive: The back stand feels pretty durable--it's even designed to be shock-absorbing. Too bad the radio doesn't perform as well as its back stand. If you really want a DSP radio with an analog face, spend an extra $6 and purchase the Degen DE321, or wait for the Tecsun R-2010 to be released. The only benefit I see to the Kchibo KK-9803 is its FM performance, which is acceptable. But if it’s only FM you’re looking for, my advice is to purchase a better-quality, comparably-priced radio like the Sony SRF-59 which, though without shortwave bands, has incredible AM (mediumwave) performance as well. 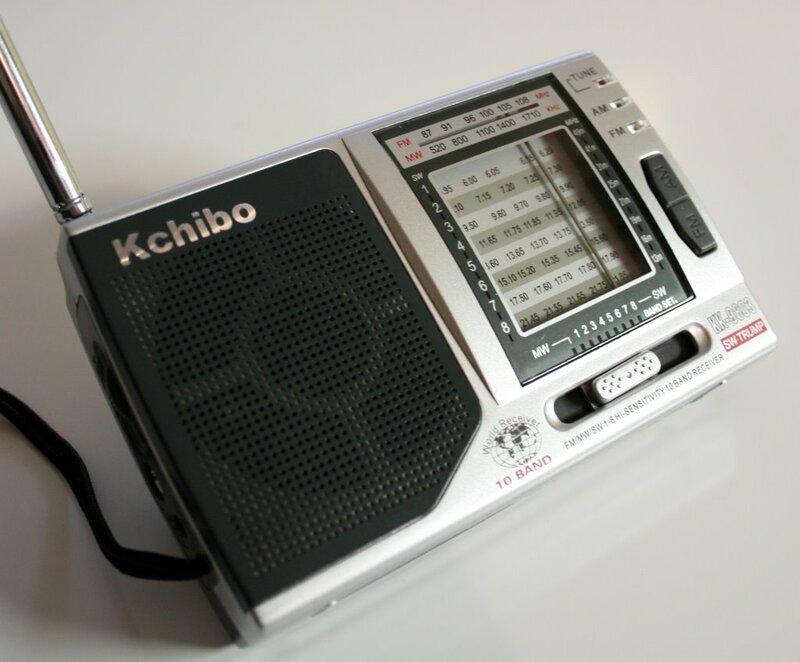 The Kchibo KK-9803 is a radio that should have remained in the all-analog realm; I imagine its performance in that form was more reliable and tuning much easier. Adding the DSP chip to this radio was an unfortunate upgrade–really, a downgrade, in my opinion. 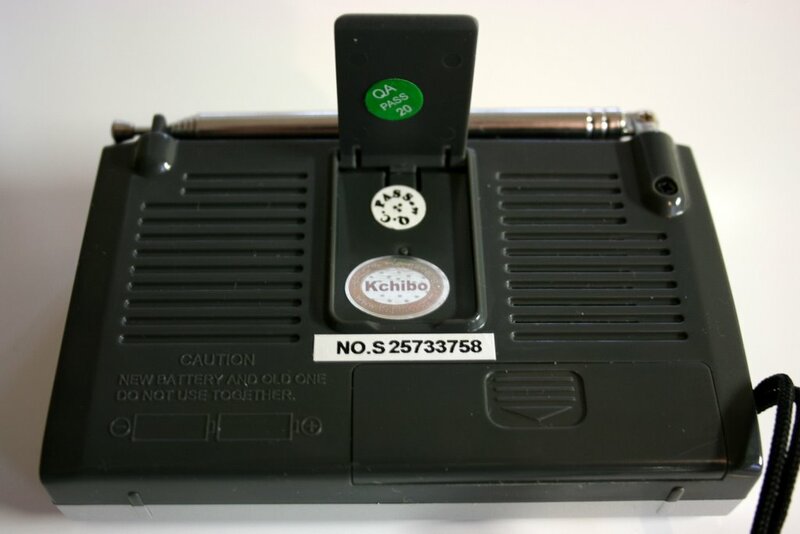 In conclusion: do yourself a favor and use the $14.90 to buy rechargeable batteries or anything else besides the Kchibo KK-9803. This entry was posted in Radios, Reviews, Shortwave Radio Reviews and tagged Kchibo, Kchibo KK-9803, Kchibo KK-9803 Review, KK-9803 on December 13, 2011 by Thomas. I have both the kchibo, kaito wrx911, degen 321, in terms of reception sensitivity the kchibo kk9803 out perform the kaito and degen. I’m just wondering why, before purchasing the kaito and degen I tried first to read the review both the kaito and degen, I’m disappointed. Thank for your article which has given me much interest of knowing more of your items from portable handsets to bigger sizes if any is there. I am only interested to purchase a portable radio with all FM/AM/SW band radio stations in a single piece,also in my budget prices —— up to Rs. 700/– if its available,do inform me,Thanks. I’m not sure what is available locally in India. I can tell you that you typically need to spend between Rs. 1900-3100 to get a decent basic portable–you can find many of these on eBay. Check out the Tecsun R-911 or, even better, the Tecsun PL-380.